MANAK INSPIRE Awards Scheme Online nominations submissions, One time registrations 2019: Online E-MIAS System for INSPIRE Award Scheme, INSPIRE Award Scheme web portal: www.inspireawards-dst.gov.in. 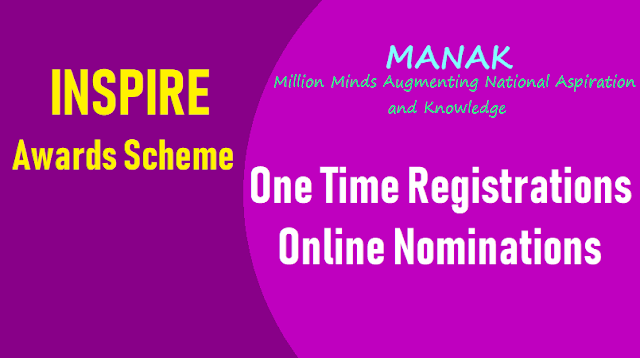 Opening of online system for nominations under revamped INSPIRE Award Scheme: As you are aware, the INSPIRE Award Scheme is being revamped under the name INSPIRE AWARDS-MANAK (Million Minds Augmenting National Aspiration and Knowledge) to align it with action plan for "Startup India" initiative launched by the Hon'ble Prime Minister of India. Regional workshops have been held by Department of Science & Technology, in coordination with the National Innovation Foundation, to sensitise all stakeholders regarding its implementation. Broad details of the revamped scheme details provided here. For this, online nominations through E-Management of INSPIRE Award Scheme (E-MIAS) system would become open to all the schools. Concerned State Nodal Officers may kindly be directed to apprise the school suitably so that they can nominate their students. The attention of the all the Headmasters, MEOs in the district is invited to the reference cited. The Department of Science & Technology, Government of India has revamped the INSPIRE AWARD scheme under the name of INSPIRE AWARDS - MANAK 2019-2020 to align it with the action plan for “Startup India” initiative launched by the Hon’ble Prime Minister of India. Regional work shops have been held by Department of Science & Technology, in coordination with the National Innovation Foundation (NIF) to sensitize all stakeholders regarding its implementation. NIF will also coordinate with NITs, IITs and IISERs for support. Online Nominations through E-MIAS system through website www.inspireawards-dst.gov.in opened on 01.04.2018 and will remain open till 30.06.2018. Submission of project synopsis (write-up) in word pdf format has now being made mandatory. The Theme of the project should be creative, innovative to meet the norms of the aim of the INSPIRE AWARDS scheme. Hence, the Headmasters and MEOs are requested to bestow their attention to motivate the Science /Maths Teachers of all managements i.e. Govt/ZP/Residential Schools/KGBVs/Model Schools/Private/Aided schools for 100% registrations and nominations with out fail. For details contact your District DSOs. It may kindly be also noted that submission of project synopsis (in word or pdf format) has now been made mandatory along with submission of online nominations. Therefore, registration of all unregistered schools at E-MIAS website (www.inspireawards-dst.gov.in) may also be got expedited so that they too can avail benefit of the scheme. The INSPIRE Awards Programme has been renamed as INSPIRE AWARDS - MANAK. The programme shall target school kids with an outreach to 10 lakh innovations (2-3 best ideas from each school) from 5 lakh schools across the country. The programme shall cover students in the age group of 10-15 years and studying in classes 6-10 of all recognized schools, whether Government or private aided or unaided, run by Central Govt., State Govt., or local bodies viz. District Boards, etc. 1) The nominations from schools will be received through District & State Authorities on existing E-MIAS CE-Management of INSPIRE Award Scheme) portal at National Authority i.e. Department of Science & Technology (DST). A synopsis of the Project that the student would prepare will be annexed with the nomination proposal. The selection criteria adopted would be based on the innovation / creativeness / novelty of the Project that the student proposes to undertake as given in the Project synopsis submitted. A window on E-MIAS platform will be given to National Innovation Foundation (NIF) to receive and shortlist nominations. 2) NIF will shortlist top 1 lakh projects for an INSPIRE Award of Rs.5,000/- per student and participation at District Level Competition. The INSPIRE Award of Rs. 5000/- would be transferred to the bank account of the student through Direct Benefit Transfer (DBT). 3) District Level Exhibition & Project Competition (DLEPC): The DLEPC will be held at District level which will be organized by the District/State Authorities. NIF will associate as Jury to shortlist 10% (around 10,000) projects. The shortlisted 10% students will further participate at State level Competition. 4) State Level Exhibition & Project Competition (SLEPC): The SLEPC will be held at State level which will be organized preferably at State Headquarters by the District/State Authorities wherein NIF/DST will associate as Jury members to shortlist 10% (around 1,000) Projects/Models for participation at National Level. 5) Development of Prototype Models: The 10% (1000) Models/Projects shortlisted from the SLEPC will be given Rs. 20,000/- each for development of Prototype Model. NIF will coordinate with NITs, IITs, and IISERs for holding of workshops and impart training to assist the students for development of prototype models. Rs. 20,000/- would be transferred to the bank account of the student through Direct Benefit Transfer (DBT). 6) National Level Exhibition & Project Competition (NLEPC): 1000 Prototype Models/Projects will participate at the Annual National Level Competition to be organised by DST. Jury members from DST, NIF and TIF AC (for Patent) will associate in the jury process and shortlist top 60 Models/Projects for National Awards and future ideation. 7) Annual Festival of Innovation: NIF will coordinate for participation of the selected 60 Models/ Projects at the Annual Festival oflnnovation in Rashtrapati Bhawan. 8) Product Development: NIF will examine the feasibility of Product/Process development and to link the top 60 ideas with other schemes of DST for which NIF will prepare separate proposal. 9) Patent: TIF AC will explore the possibility of filing the patents of shortlisted projects/models from the NLEPC. 10) All other guidelines/norms relating to DLEPCs, SLEPCs and NLEPC etc. shall remain same as was in INSPIRE Awards Scheme. • Fill in the relevant details in the page and fields marked with * are compulsory. • You will get a unique application number to you mail ID after successful filling of the registration form. • Remember of mail ID and password is must. • Then click on to proceed. • Please generate the acknowledgement for reference. • Email notification will trigger to the mail address with your use ID and to create a password you will get a link (URL). • The new password should be at least 6 characters including combination of alphabets and numeric. o The above items should be recorded in the register or in the file meant for Inspire. After registration, the guide teacher and the student should prepare the write up indicating the theme of the project/exhibit, aims and objective of the exhibit, working principle, conceptual frame work, functional value. The write up may be shared with other science teachers, subject experts available in neighbourhood areas. The idea is to have wider consultation for grooming the ideas and improving it. The write up may be made DTP in English language in the word or pdf form and may be uploaded in the website of Inspire awards. • After filling all the information the format press view & edit button if user wants to edit the particulars of the students. • After editing click on forward application. o students bank details are compulsory for DBT. o Uploading write-up in word or pdf format is mandatory. For this year: Online nominations through E-Management of INSPIRE Award Scheme (E-MIAS) system would become open to all the schools. Concerned State Nodal Officers may kindly be directed to apprise the school suitably so that they can nominate their students. So, registration of schools and online nominations' for Inspire awards which commenced at website. Online nominations Starts from: 10-03-2019. The nominations will remain open till 31-07-2019.